When it comes to creating newsletters, you probably only think about the ones that go out to your clients. From product sales to social marketing updates, newsletters are a great way to keep customers engaged and coming back to your company for more. But, did you know that internal newsletters are just as important? We have compiled a list of the top 8 reasons why your company needs an internal newsletter so you can keep your employees as engaged as your clients! Employees don’t usually keep up with their coworker’s roles unless they happen to be working in the same department or team, which can lead to a lack of company knowledge. Having an internal newsletter is a great way to highlight important projects each department is working on and may encourage employees to reach out to one another for questions and collaborations based on personal experience. It’s important that everyone in your company is up-to-date on the latest company endeavors, as well as the latest news about your industry. An internal newsletter is a perfect place to provide links to new company products/marketing services, as well as updates on competitors or changes within the industry so all employees can be informed. Whether you have a small company or are as big as Google, it’s important that new employees and clients are recognized company-wide. When there is a new addition to the company, many employees get caught up with work and don’t take the time to get to know the person or their role, so welcoming them through the newsletter is a great way to keep everyone in the loop and encourage a conversation! 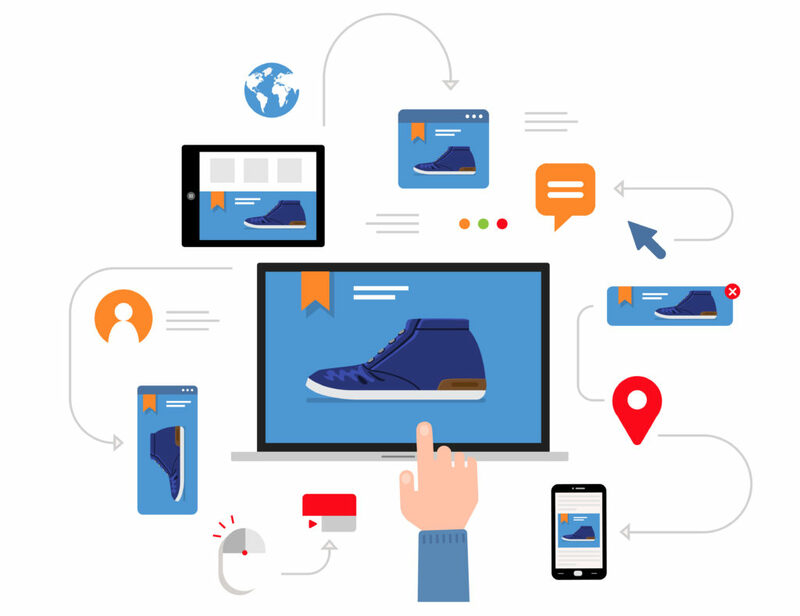 Digital marketing has evolved and stretched its fingers across nearly every digital platform imaginable. 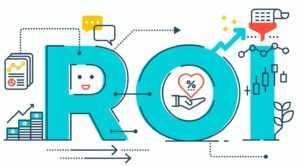 From the paid ads you see on Instagram, to the web pages that have fostered their SEO strategy enough to land on the first page of Google, your opportunities for reaching prospects are broader than ever. Despite the surplus of opportunity in the digital landscape, email marketing remains the most effective method of marketing to your customers. 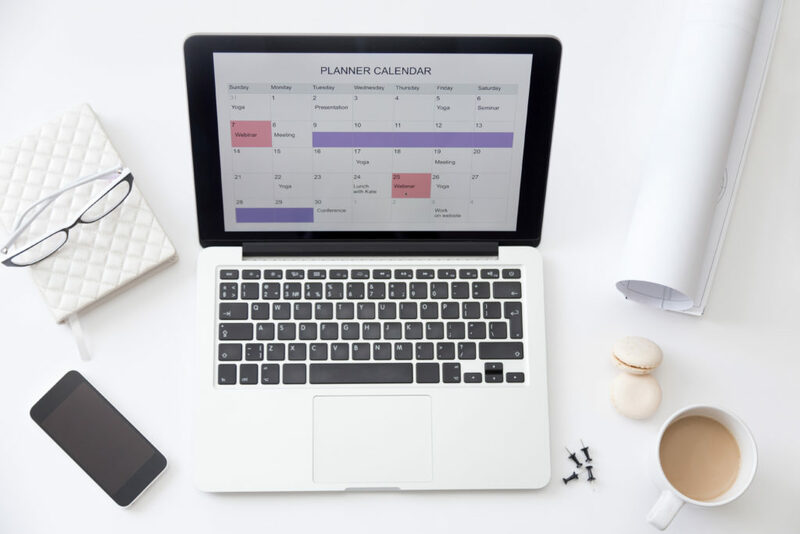 Before launching your next email marketing campaign, take a look at the top email template designs for 2019. 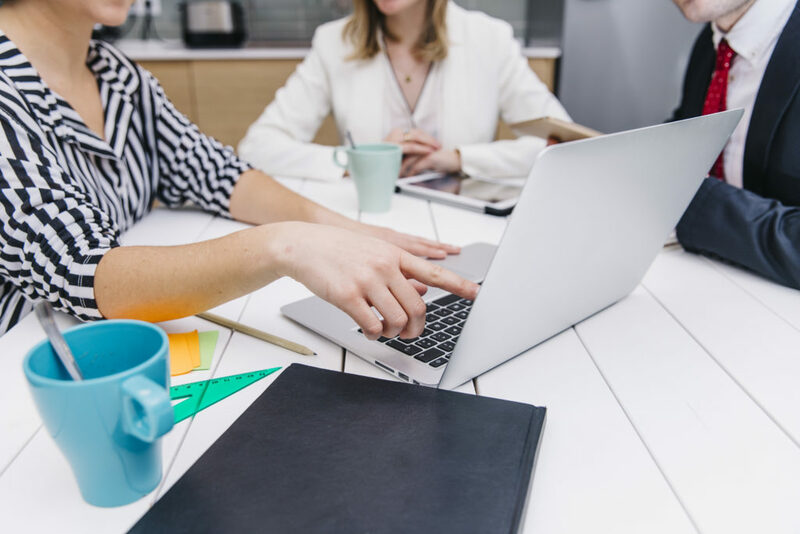 Pardot HTML email templates have a broad range of capabilities, and between these 7 examples, you’ll be able to pick and choose ideas to adopt in your own emails based on your marketing goals. 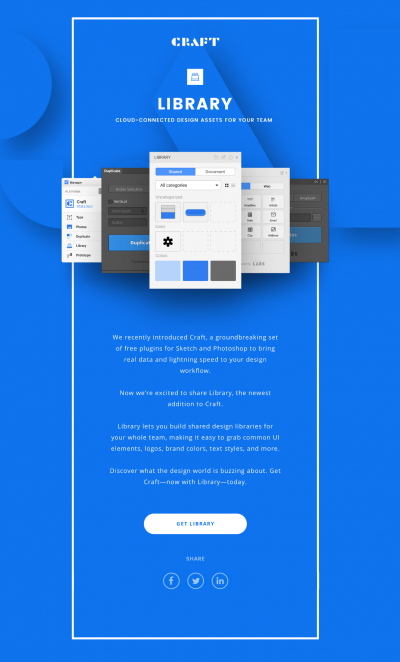 Starting off our list of email designs is a template curated by an agency well-known for its design prowess. While we must give credit to the clean overall design of the email, we would like to highlight the use of a single call-to-action after the email’s body of content. Using only one CTA has proven to improve conversion rates since it erases any doubt about which path is intended to be taken upon review of your email. You’ll notice that many of the templates we are recognizing here utilize a single-column layout, and this is no coincidence. Your customers continue to rely more and more on their mobile devices for both their personal lives and work, especially when it comes to having email access both in and out of the office. A single-column layout can easily be optimized for mobile viewing, and Yesler provides an excellent example of how a content-heavy email can still be designed with mobile in mind. The extent of your offerings cannot be summarized in a single case study, so you’ll need to select a targeted focus for each one. 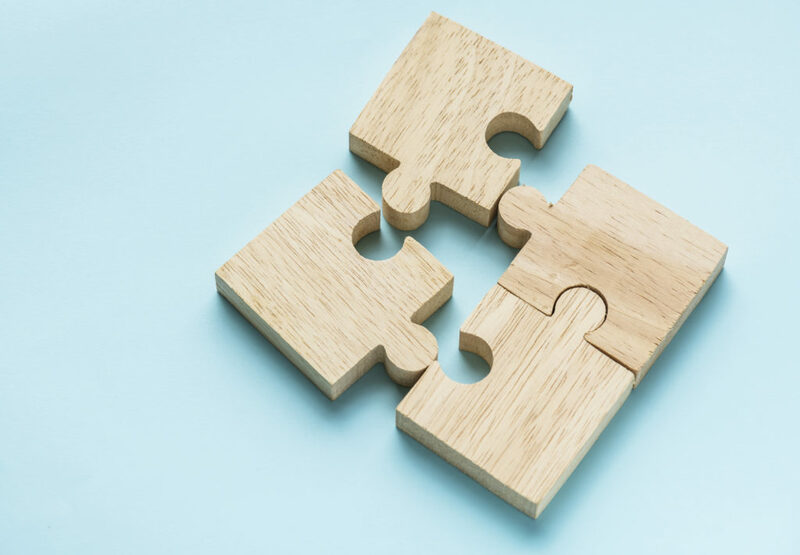 While one case study could serve to highlight how your services had a direct impact on rebuilding your client’s strategy from the ground up, another may emphasize an instance when your team introduced a client to an additional process that contributed to their further success on an already effective system. However, all of your case studies should be curated to convert and engage, helping you to fill up your lead funnels and retain accounts. You don’t want your clients to browse your website only to find an unfamiliar case study with their name attached to it. 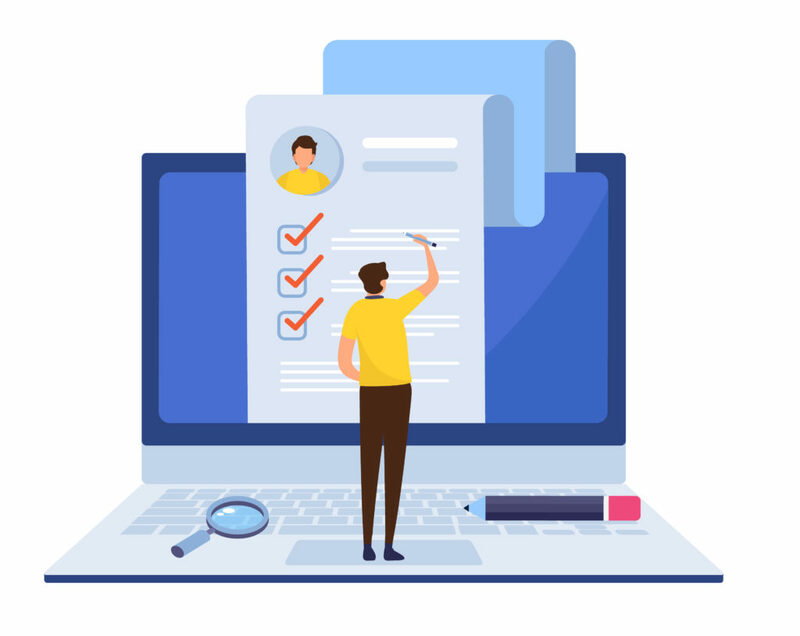 Obtaining consent from you candidate is necessary in order to build a case study that is verified by both parties and will open up the opportunity for direct quotes to add further validation to your case study. When your prospects can relate to your case study candidate, they are far more likely to see how your products or services could, in turn, benefit them as well. This familiarity can be easily fostered by conducting your case study on a client within a particular target industry. We’ve attended the webinars, we’ve read through the release notes, and we’ve actually used the features. With our customers in mind, we trained our team on these new features to improve our Salesforce consulting services. In addition to the full release notes found at the bottom, here are some of our favorites. Description: Cadences are custom sales processes that guide reps through handling prospects of all types. Create consistently scheduled cadences of outreach activities that alerts and helps reps nurture their prospects. Work queues prioritize the next steps reps should take with their prospects. The app provides them with approved email templates and call scripts to help close the deal. Benefits: Shows which prospects are ready for each outreach in your sales cycle. Handle prospects in half the time than it took before. Ensure company-wide uniformity of sales best practices. Description: With 5,000 votes on the Appexchange, this Salesforce update allows users to pin certain filters on modules. Have a custom filter on tasks for past due tasks only? When you navigate to the Tasks object, it may default to recently viewed tasks, but now you can pin custom filters to default to. Benefits: Saves time navigating across multiple objects. Increases customization of the platform. Description: This Salesforce feature gives companies the power to set up custom programs with certain training links, per user. Links can include Salesforce articles as well as external links. Benefits: Uniformity on training new and existing users with the ability for tracking. Maximizes the use of the Salesforce platform, users don’t need a separate system for training. Visit our Sales Cloud services page to learn how we can optimize your sales processes. Corrao Group uses Salesforce for everything from client profiles, internal & external project management, and everything in between; we’ve deployed the Salesforce platform company wide. We implement Salesforce integration best practices in order to make sure we get the most out of our Salesforce organization. Our project management team utilizes Salesforce as a tool to track projects, assess our budgets, and bill employee time for maximum optimization of the platform. Before using Salesforce, Corrao Group used to run on a lot of spreadsheets and constant overseeing. We had to set up our internal projects differently than external projects to bill time, and it was difficult to determine how much time was needed to complete each task in a project. When we adopted Salesforce in 2008, we became both a customer and a partner in the same day. Our mission with Salesforce was to maximize not only our investment with the platform, but our clients’ as well. Once we switched to Salesforce for our project management, we had to evolve with our clients and learn how to utilize Salesforce integration best practices for our business consultations. Larger projects required more technical knowledge, and as power users of the platform, we took it into our own hands to figure out a way to make Salesforce work for us. Salesforce has provided visibility into our entire business process and has allowed our Project Management team to work more efficiently. We have tailored Salesforce to work with our own management tools from sales to kickoff, and now have both internal and external projects set up the same way. A popular feature we created was the automation of project communications to both the Salesforce Account Executive and the customer themselves. Without having to track down their Project Manager, automatic updates are sent out with timestamps regarding how the consulting project is tracking. The customization of Salesforce is endless. We are able to add important details into each project such as files, quip documents, or even chatter threads. We have also implemented advanced dashboards such as Skuid in order to prioritize tasks and streamline management by utilizing Salesforce integration best practices. 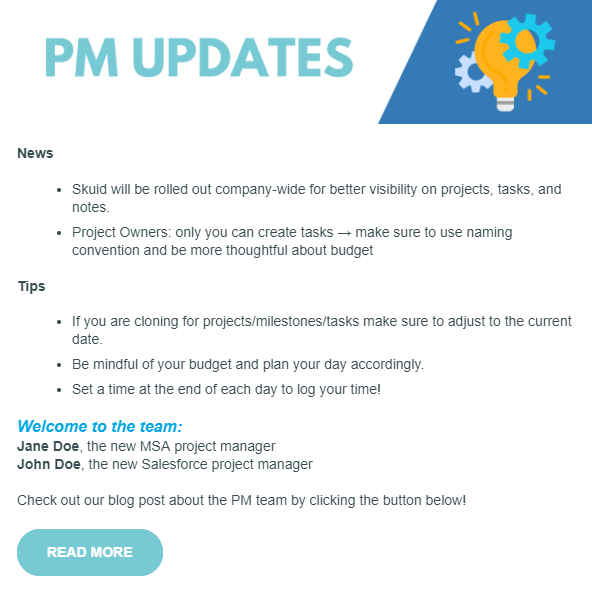 It is now easier to help project managers reassess how to work efficiently with the wide visibility into their projects, as well the ability to optimize Salesforce to see each individual’s skill-sets. Moving over to Salesforce for project management did not come easily without the education about how Salesforce would work in our favor. Our whole company has to work together to learn how to manage our projects and prioritize the most important ones. From internal to external projects, we have been able to utilize Salesforce throughout all of our business processes, and with every new feature added is another way for us to maximize our investment with the platform. The future of using Salesforce for our project management is ever-evolving. We have experienced the infinite customization of Salesforce, and the perks of better visibility so that we can spend less time overseeing, and more time helping our customers. We have ongoing conversations about ways we can continue to optimize our processes, as well as reassessing how we budget out our time. With integration tools, we are not only able to streamline our own processes, but we can help our customers do the same. Our mission is to maximize our customers’ Salesforce investment, but in the process of doing so, we have continued to maximize ours. The advantages of Salesforce are endless, and we will continue to evolve our project management as Salesforce evolves with us. 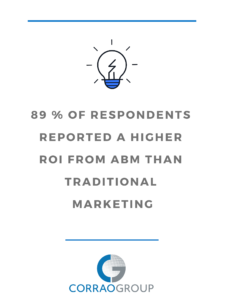 Author Jack Corrao iiiPosted on February 12, 2019 February 28, 2019 Categories UpdatesLeave a comment on Where’s my Account-Based Marketing ROI? New users can be so overwhelmed with Salesforce Einstein Analytic’s features that it could take up to one year to use the application. Unfortunately, a year is too long to see an ROI for on such a tool. The solutions to this are Templates, out of the box sets of dashboards and reports for new users. Templates provide an expedited start to users starting out with Einstein Analytics. Up and running within twenty minutes, they contain best practice KPI’s and are available to customize. Templates give users the power to package and distribute their apps to others in your company, partners, and even customers. 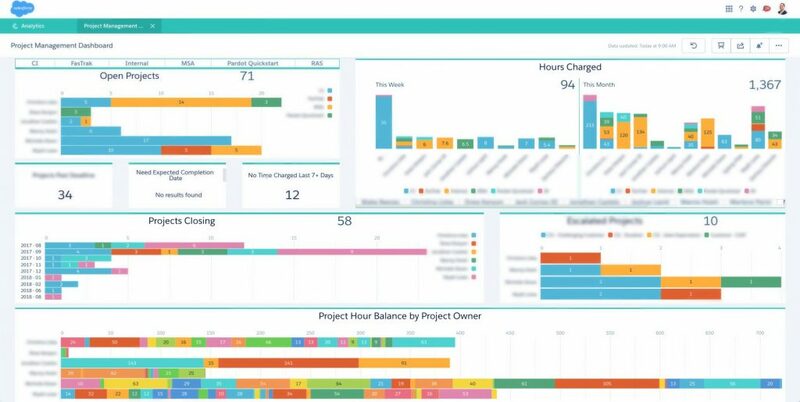 Apps give you ready-made dashboards automatically populated with Salesforce data to show KPIs. If you’d like to show Marketing’s influence on the Sales pipeline, “there’s an app for that.” Templates will allow you to package multiple apps and share them with the team and others to view real-time information from your system. – Quick Start: A configurable wizard helps you adjust analytical assets in your system. – Intelligent KPIs: Templates will adjust and recommend best practice KPIs based on your company type. – Advanced Data: Have data spread across the entire system? Templates automatically combine data from Opportunities, Accounts, Products and more in one view. Templates are a great way to start out simple and quick, but you’ll soon need more as your business grows. Professional help is always recommended. Experts who have completed hundreds of Salesforce analytics implementations can take your experience to the next level. 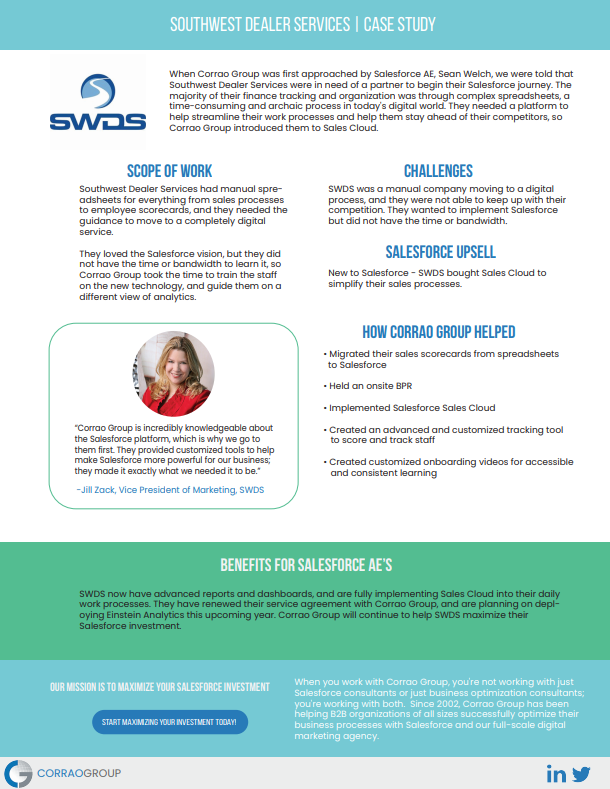 Corrao Group has been implementing Salesforce since 2008, completing over 2,000 implementations. Check out our Salesforce implementation services here to see how we can help your company with Einstein Analytics. SALESFORCE AND MARKETING BEST PRACTICES STRAIGHT TO YOUR INBOX!